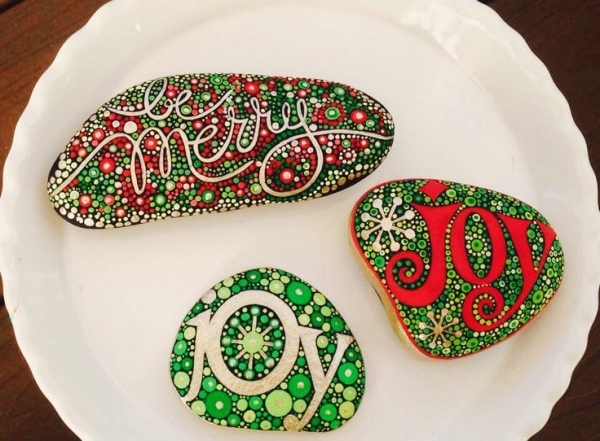 The cold frosty nights, children singing carol and freshly brewed hot chocolate with cookies for all. Yes, you guessed it right! Christmas holidays are special for us all. From decorating the X-mass trees, to hanging the socks and getting gifts from our secret Santa, we all love this festival of bliss and glee. 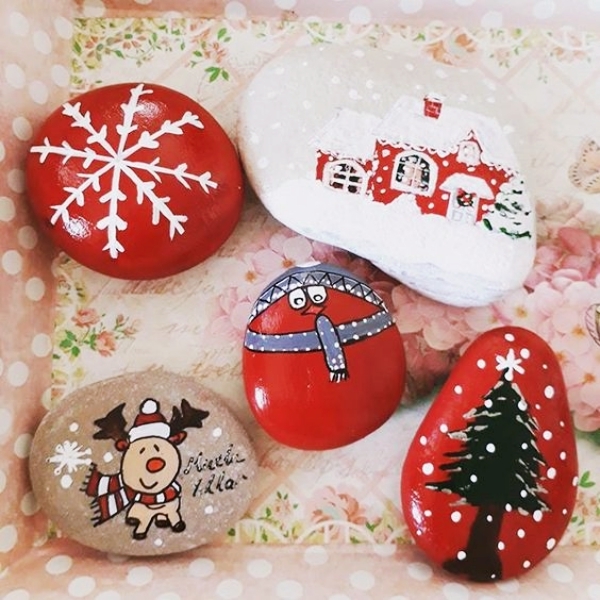 But how can you make this Christmas special for you and your loved ones? Well, greeting cards or wine is the conventional gift everywhere. Why not try making something new? Oh don’t worry. You don’t have to keep surf the Internet now to get something cool. 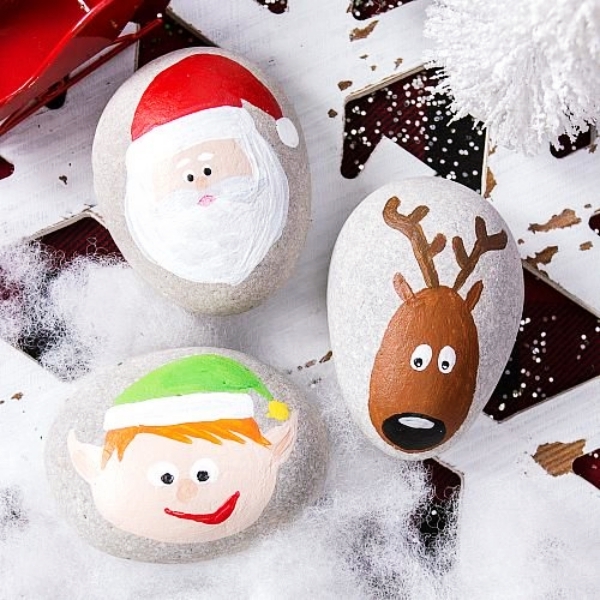 Because this time, there is a better plan – to make handmade DIY Christmas Painted Rock Ideas and surprise everyone with these endearing little rock munchkins. 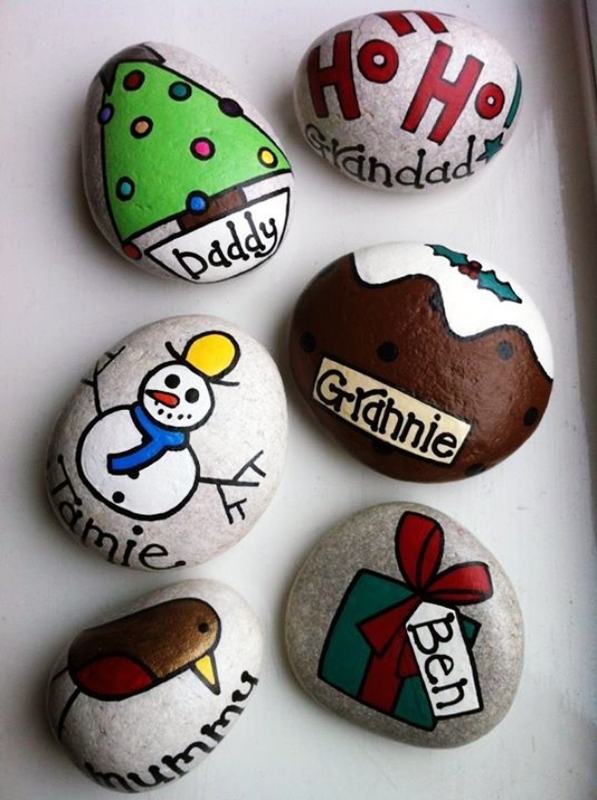 All you need for this is some really vibrant all surface paints, some paint brushes and the rocks. 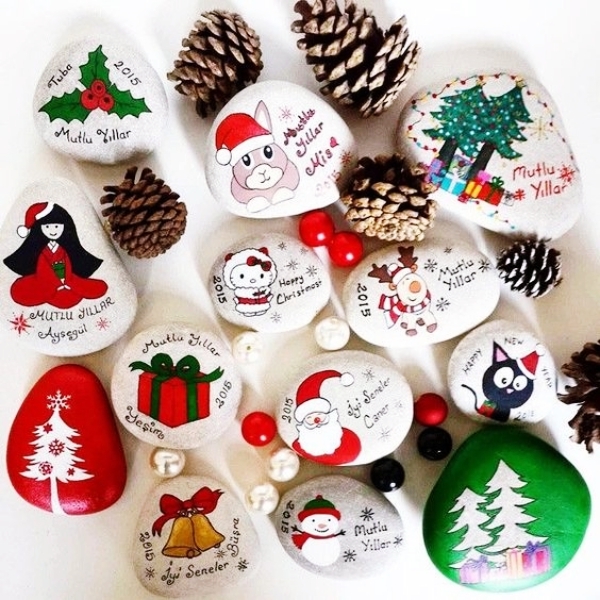 So sit down and read below some of the ideas to create some exquisite DIY Christmas Painted Rock Ideas. 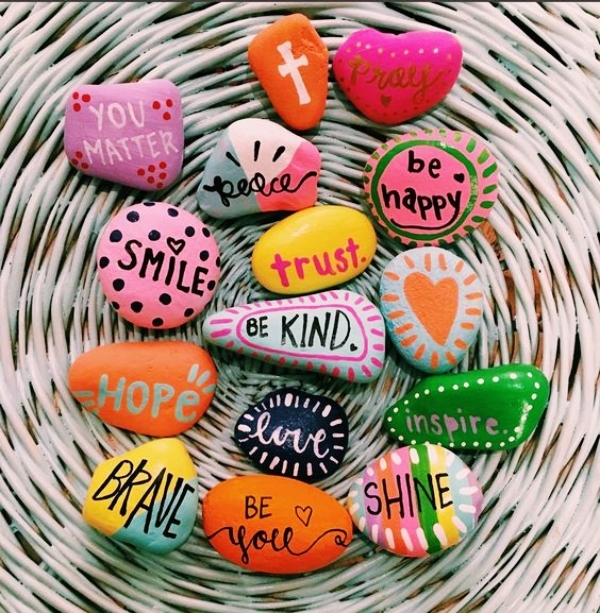 Rock and pebbles are the best source to create lively pieces for your indoor spaces too! Take the rock and paint it a dark hue of blue. 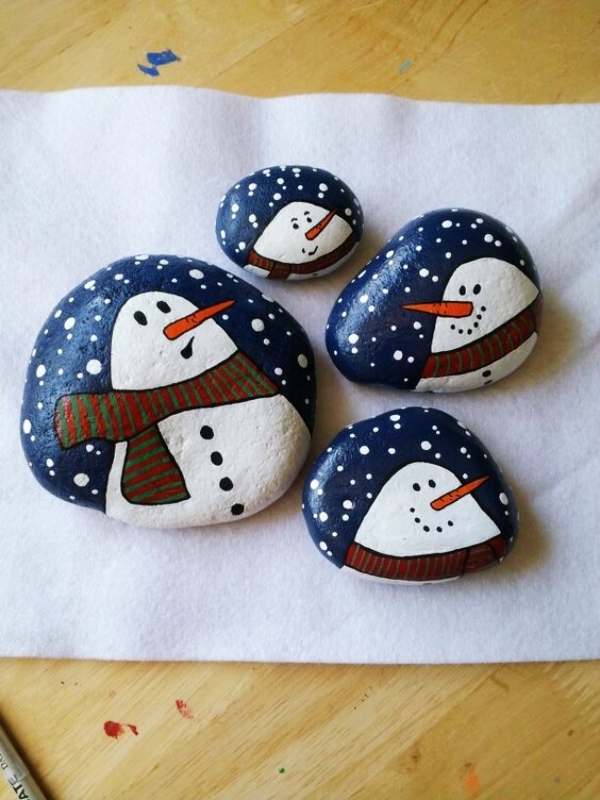 After it has dried up, take some white paint and make a snowman. 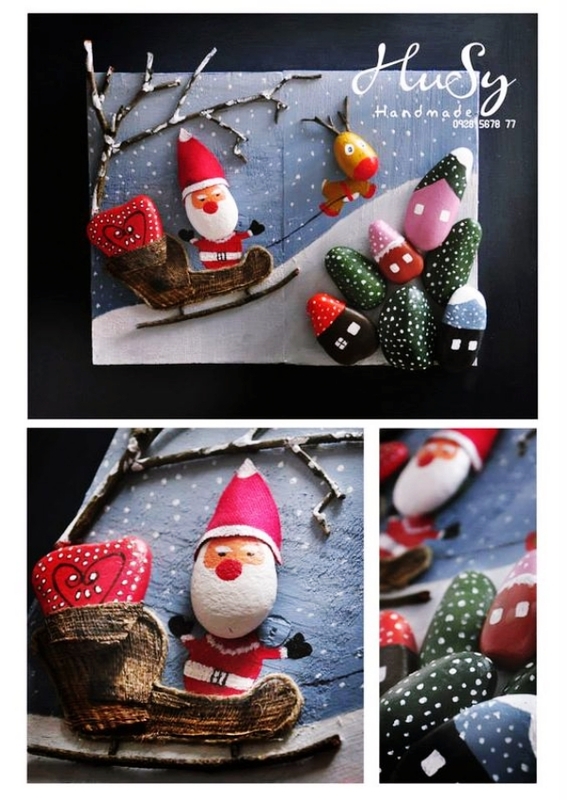 Add little details such as the carrot nose and two black eyes. 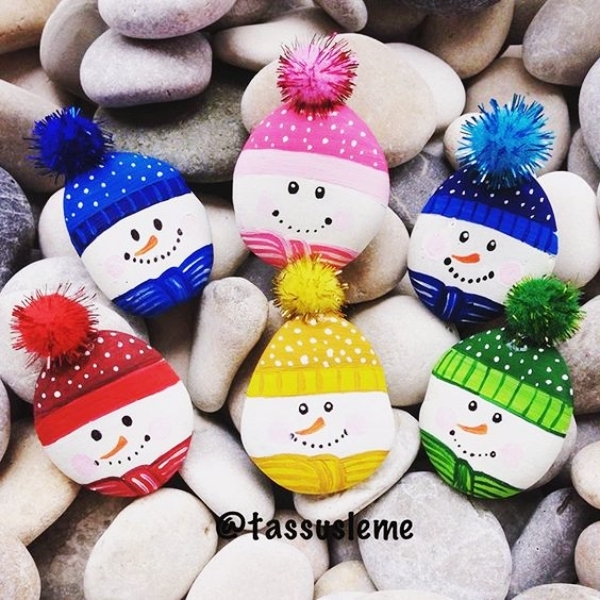 If possible give our little snowman a little scarf for the winter nights. Hold on to the reindeer before they ride away with Santa! 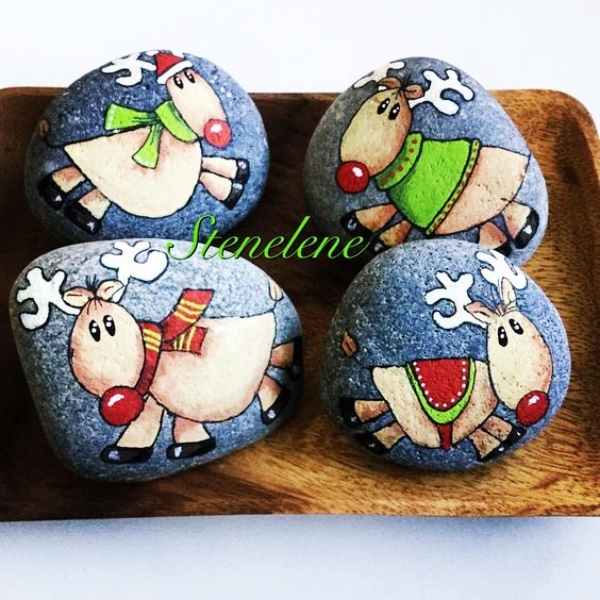 Make long reindeer faces on the rock and give them a round nose. Let their eyes be wide open and don’t forget to give them some gorgeous antlers. 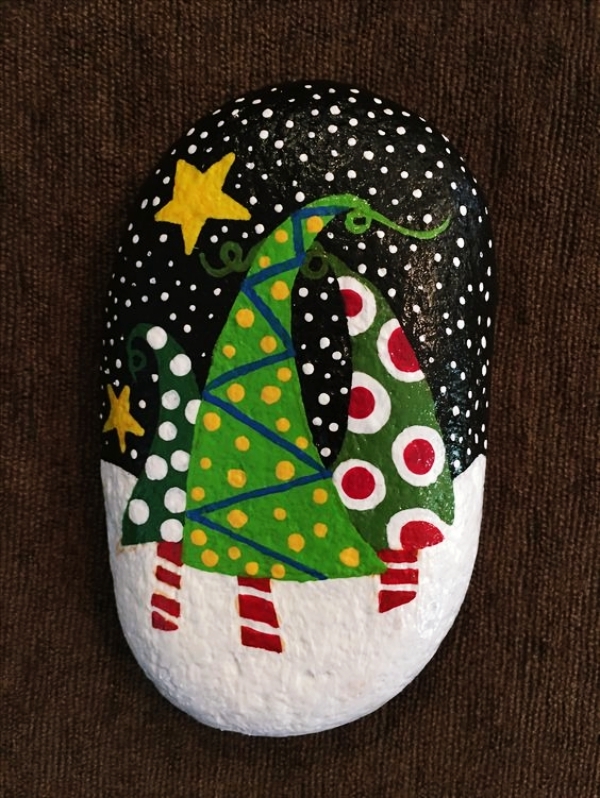 For your loved one, paint a rock in absolute black or white. 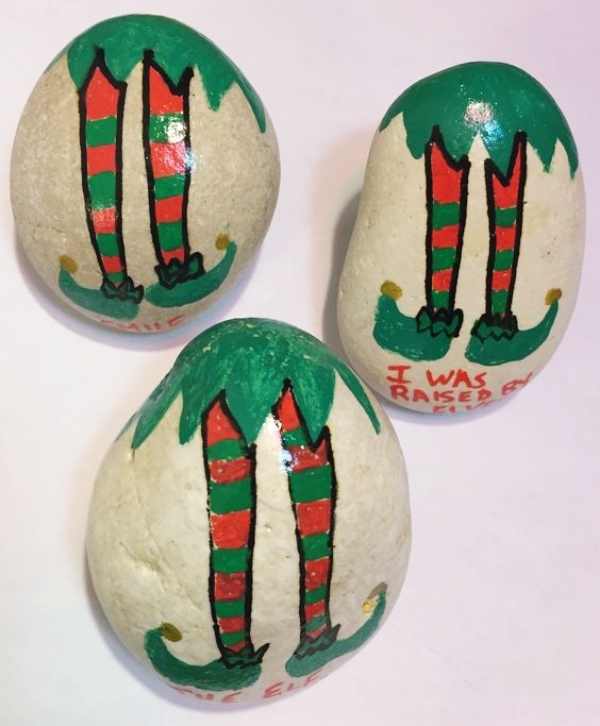 Thereafter, take some green paint and a thin brush and draw mistletoe. Finish it by drawing two little red berries on it. 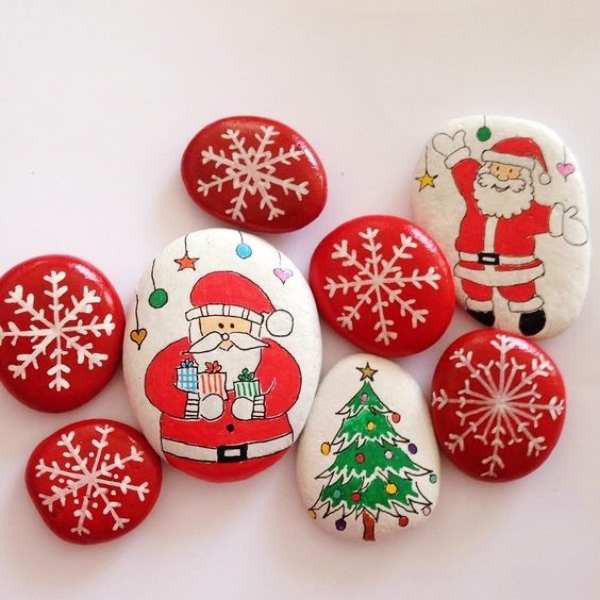 Who doesn’t love Santa? 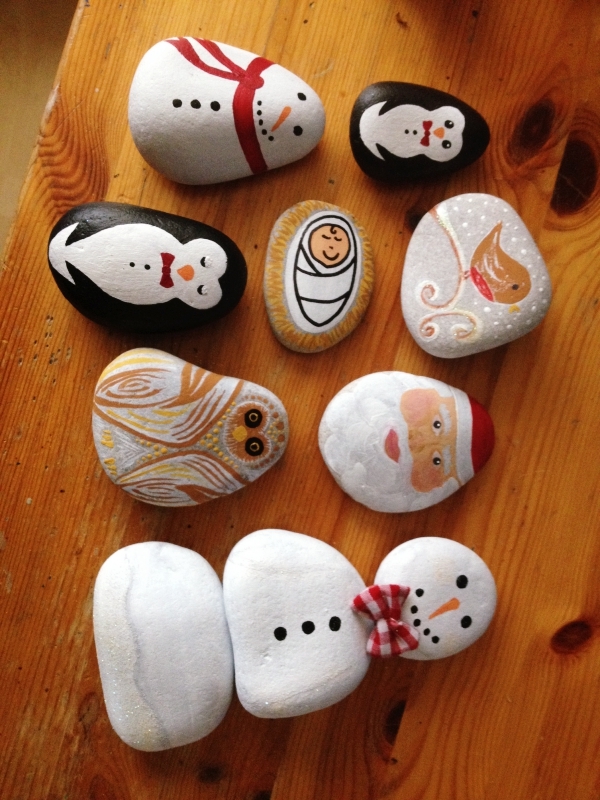 If you are planning to gift something to the young ones, nothing could be better than this rock and pebble art inspiration. 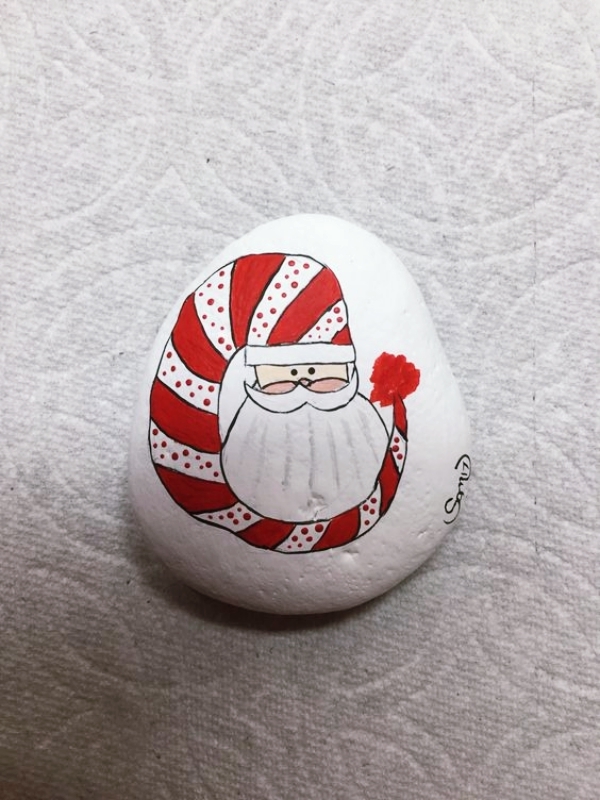 Draw cute adorable Santa faces with some red and white on the rock. 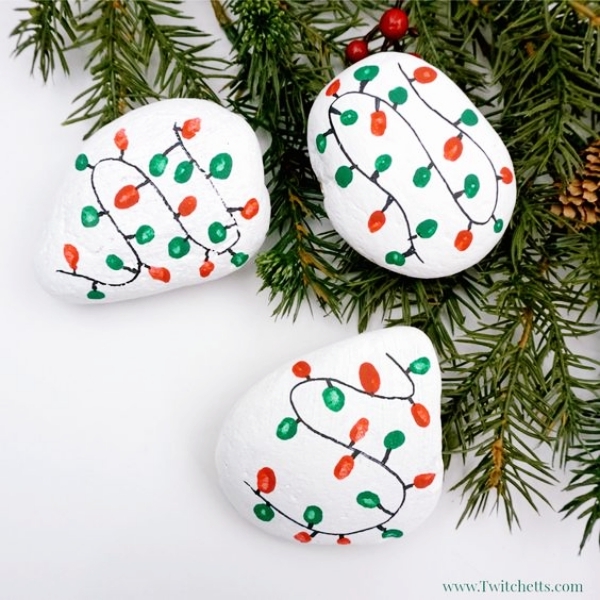 Then, take a red ribbon and paste the two ends on the rock with a strong adhesive. 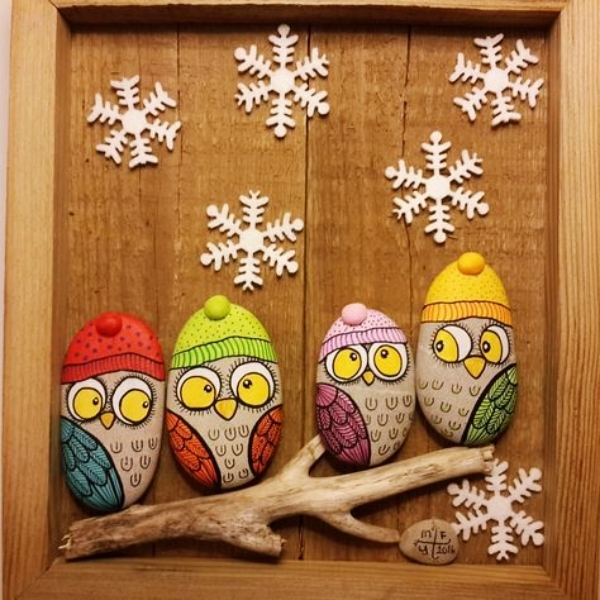 You can use this to either hang at your home or to gift the children. This looks as adorable as it sounds. You can paint the background grey or keep the color of the rock as it is. With a small brush, make a branch of a tree and on top of it, put two small birds facing each other. You can also give then a Santa cap each. 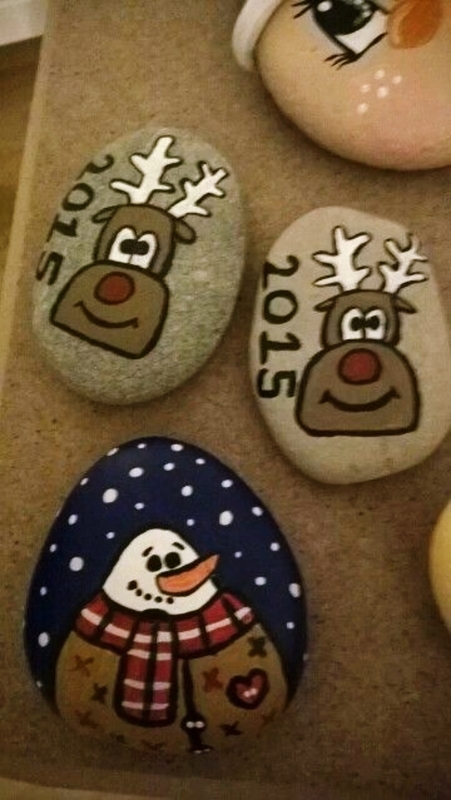 Make Rudolph extra happy by painting his face on the rock. Give him a big red shiny nose. If possible, paint the background black with a starry sky. This is a very easy one. 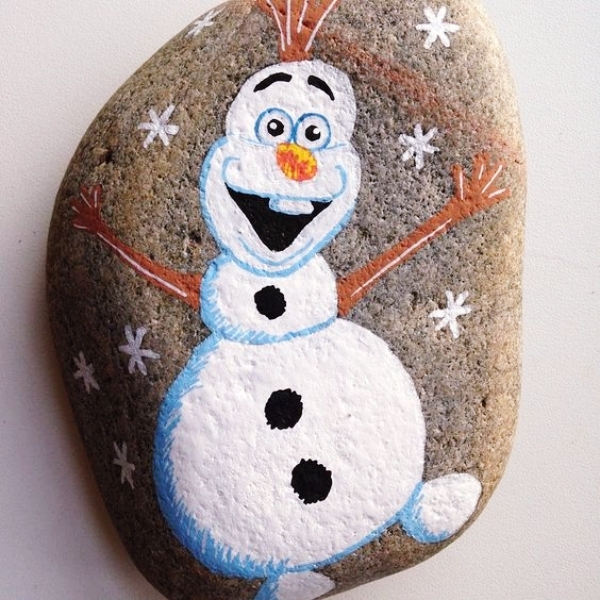 Paint your rock in half blue and half white. 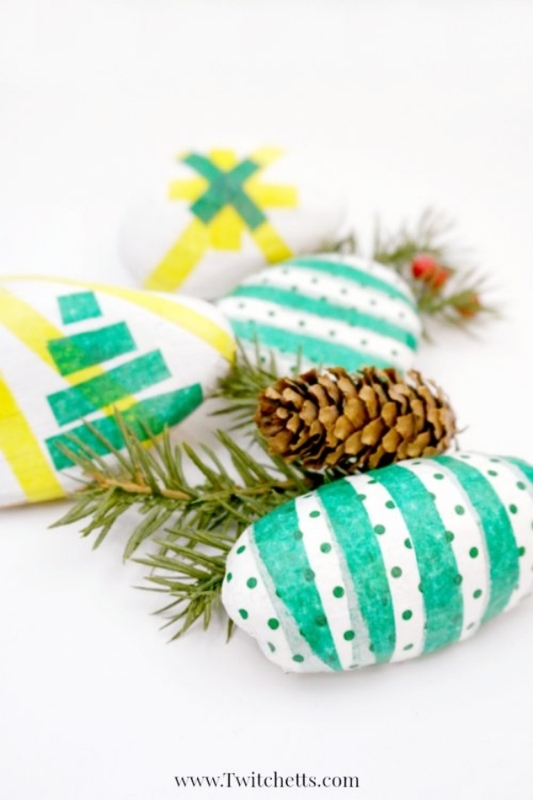 After it has dried up, make an X mass tree with some green and brown. Also include some twinkling lights on it. Fairies are an integral part of this season. So take your rock, paint it fully red. Then, dip your brush in white and make a small fairy on it. Remember to give her golden wings and a wand. Everyone loves to wear these. 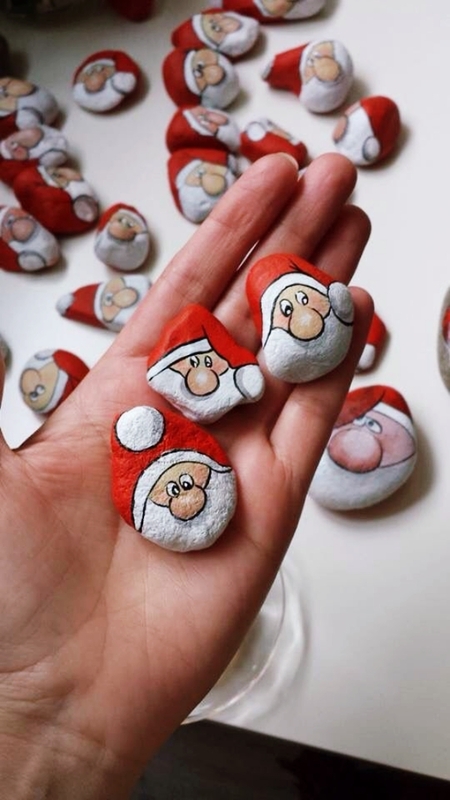 So make some red Santa caps on the rock and make it look adorable. 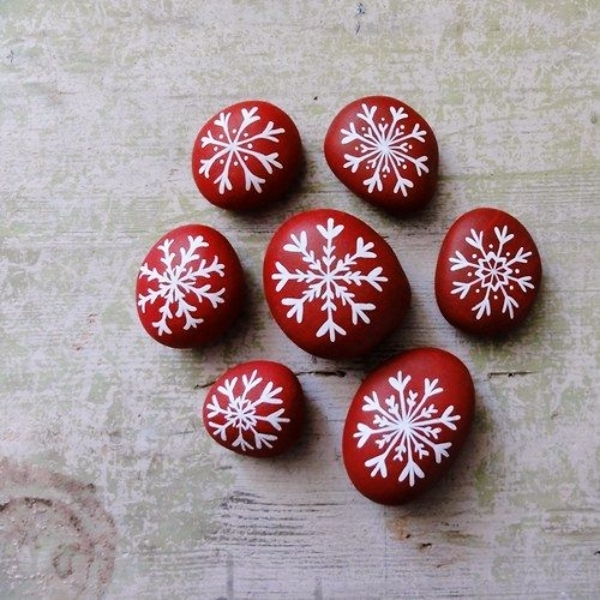 You could also accessories it by spraying some glitters or pasting small beads on it. 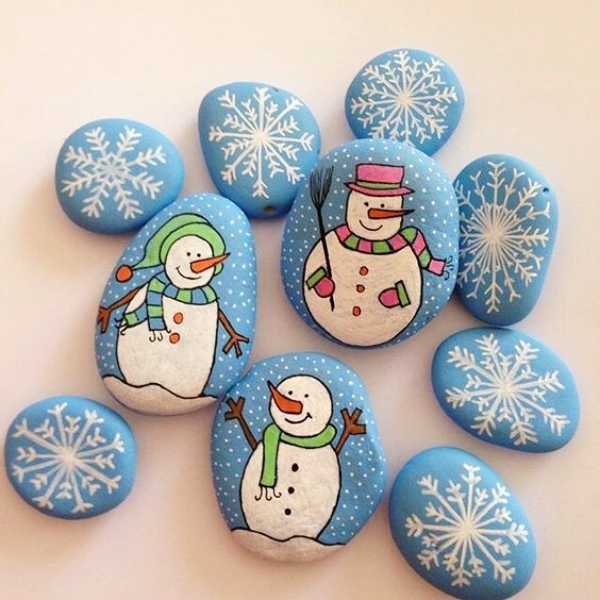 These rocks can bring luck and peace to your cherished once. Paint you rock with some copper or bronze paint. 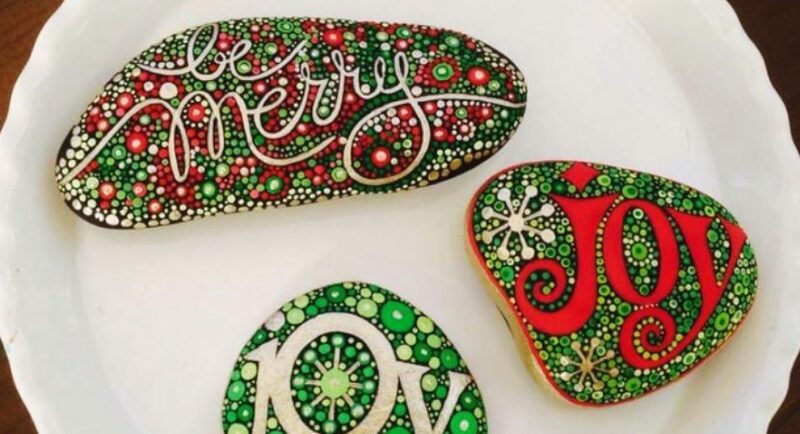 Upon drying, write words such as “Peace”, “Hope” and “Believe” with a black brush. The chiming of bells fills the atmosphere with such good vibes. 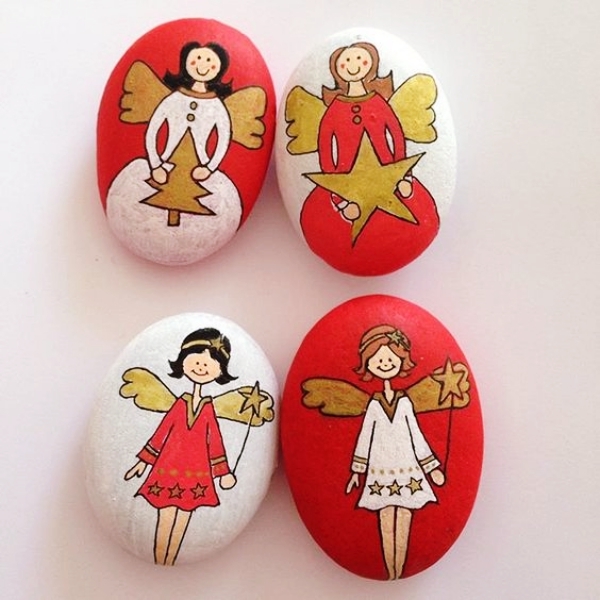 So paint some golden bells with red ribbons adorned on it and decorate it at your home. 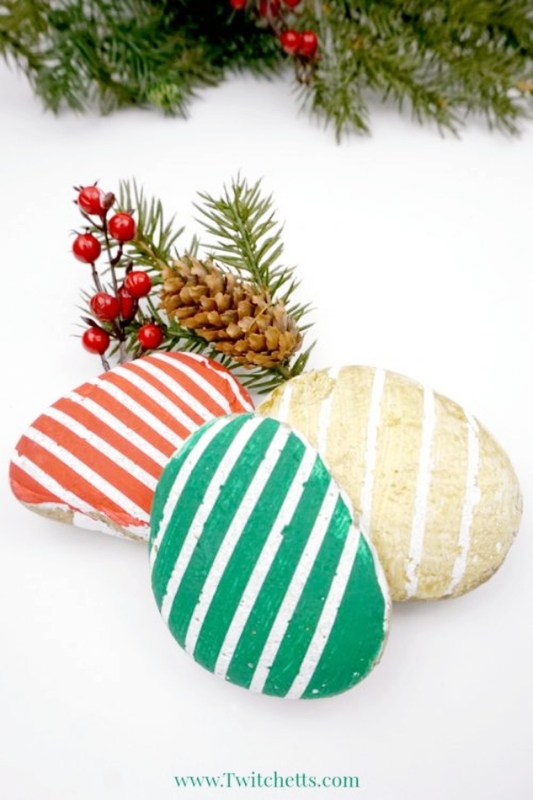 Are you a candy cane fan? 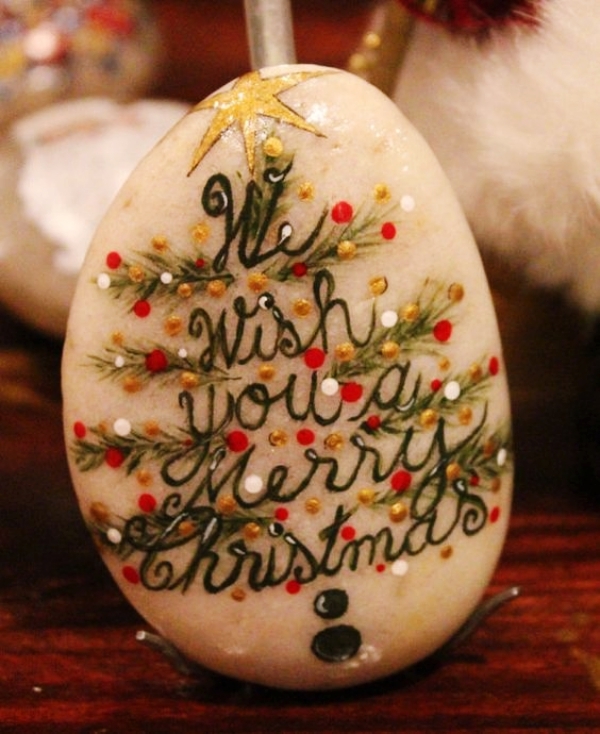 Then why not paint it on your rock. 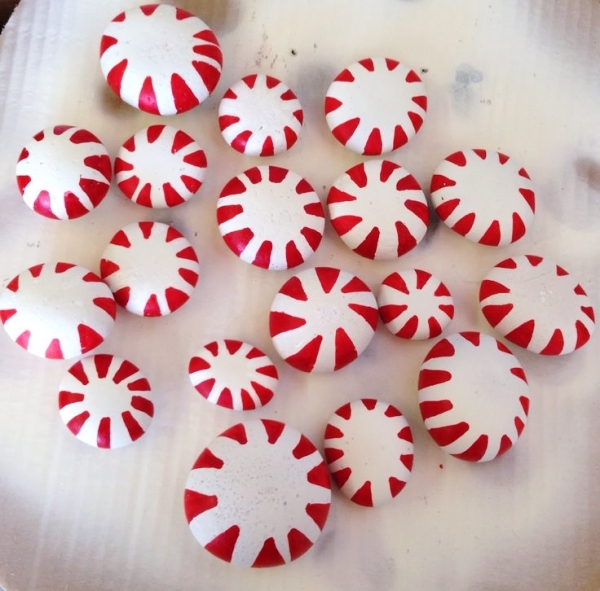 Simply use some red and white paint and make luscious candies for yourself. Do share it with your pals. Paint you rock in some Caucasian blue. Then take a toothbrush, dip it in white or silver paint. With the help of your thumb, rub the bristles in a manner that the paint is sprayed to make tiny dots which look like stars. 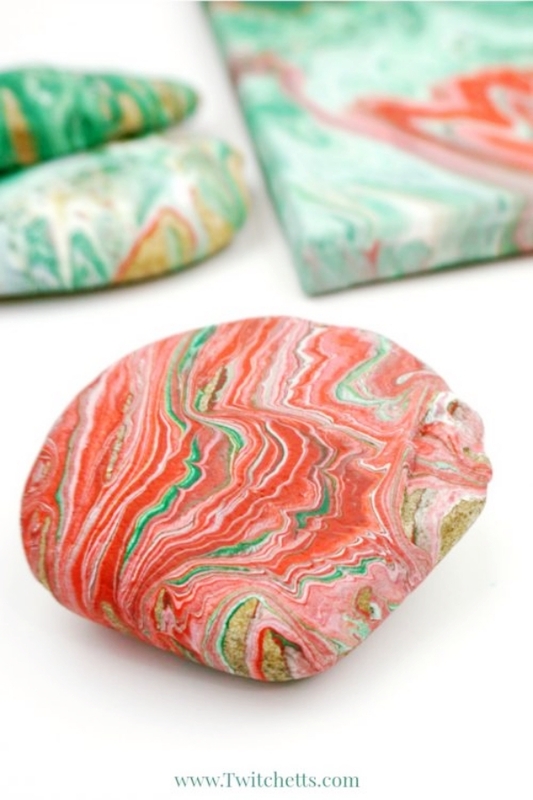 You will get a beautiful starry rock in no time. 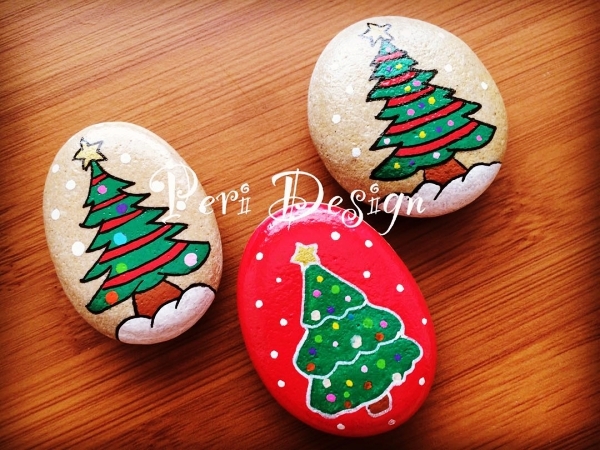 Just paint you rock in complete silver or golden color. Then, take a thin brush and dip in black paint. 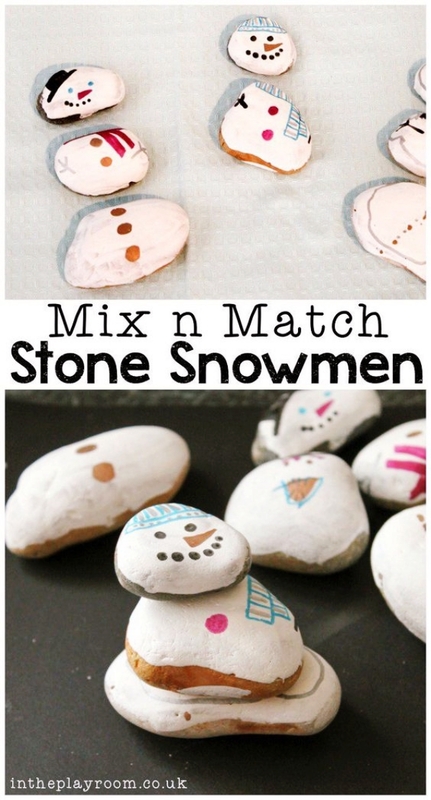 Carefully make a snowflake each on every rock. You will simply love the finished look. Yes. 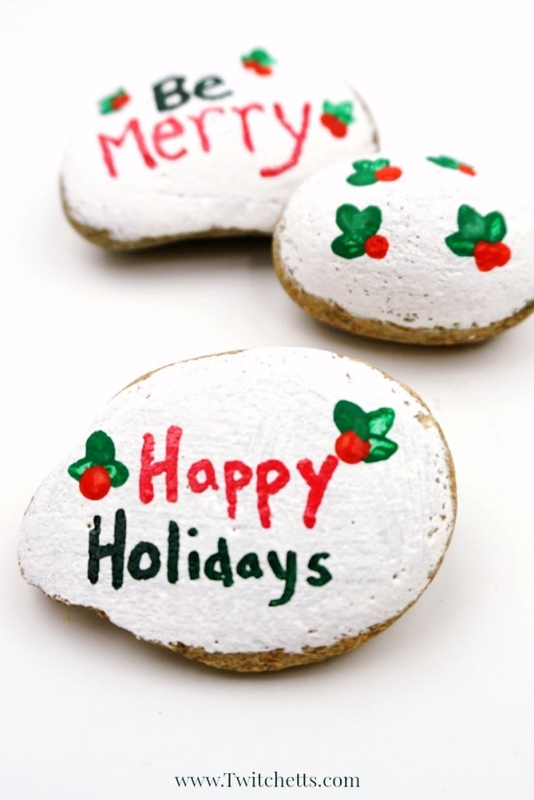 Wish your dear ones and yourself with a rock that says “Merry Christmas”. You can use a marker first to make an outline of the fonts that you wish to write in. 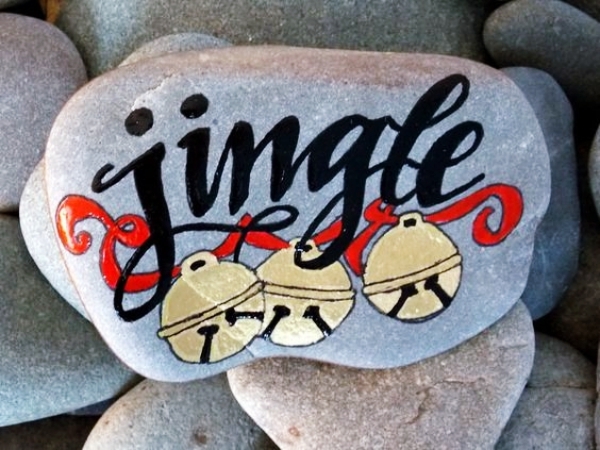 Then, take some paint in a brush and fill the letters with some red, white and green. 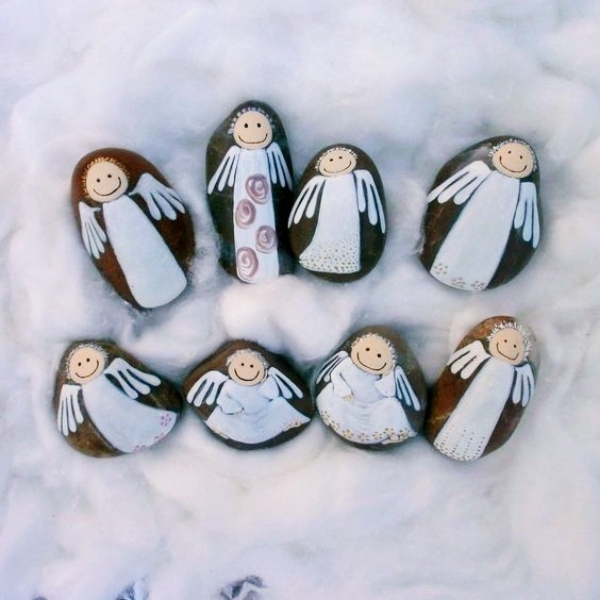 Christmas makes us all forget our sorrows and celebrate with each other. 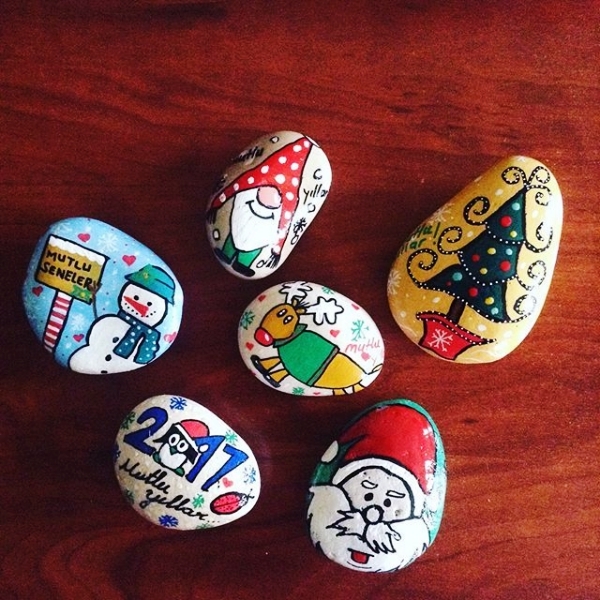 Painted Rocks are a great decorative piece for homes and can be used to gift our friends. So get a little artsy and start painting.